This White Lightning Juice with white turmeric, honey, lemon and coconut water derives its name from its effect on your taste buds. They will light up in new and surprising ways. I love juicing with yellow turmeric because of its healing properties. It’s slightly bitter taste brings back memories of the times I spent in Bali where I drank turmeric juice on a regular basis. Turmeric is used medicinally for a wide range of health issues including inflammation, skin problems, healing of wounds, flue symptoms, skin problems and digestive problems. My friend recently told me about white turmeric which I have wanted to buy forever but had never been able to find. She gave me some yesterday and here’s the result, a juice that will light up your taste buds. “White” turmeric is mostly enjoyed by South-East Asians. It is sold in spring and summer in their local markets. In Europe white turmeric can be hard to find and you will never see this variety in a local supermarket or health food store. Chinese supermarkets are great places to try. 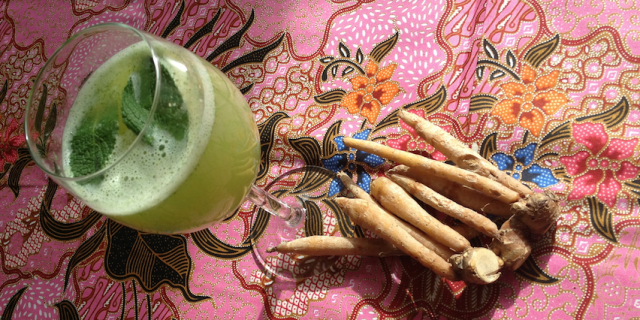 White turmeric has a lighter, whiter flesh than yellow turmeric, but its flavor is more pronounced and in my opinion more delicate. This White Lightning Juice is great if you are coming down with a cold or as a recovery drink after a work-out to get an electrolyte boost. 330 ml young coconut juice (I used Vita Coco) For a raw version use fresh coconut juice. Add all ingredients to a high-speed blender. Pulse until smooth. Serve cold.